Aphrodite Lacquer, Lately there are few over the counter polishes that get me excited. OPI seems to recycle the same metallic red, blues and purples all year round with a few gems here and there. China Glaze's formula is becoming suspect and Butter London with all their fanciness is getting too expensive for me. Don't get me wrong there are lines like Loreal that have been pretty impressive lately and I appreciate Maybelline's attempt at trying to put out some glitter bombs, but I wanted to support more Indie labels. 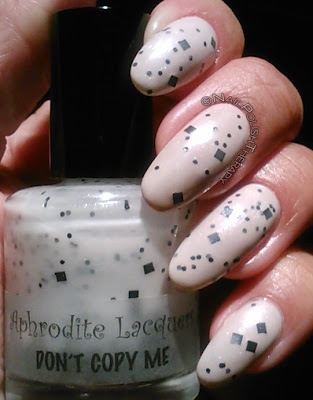 So I picked up Aphrodite Lacquer's "Don't Copy Me" because I only had 1 other black and white glitter. 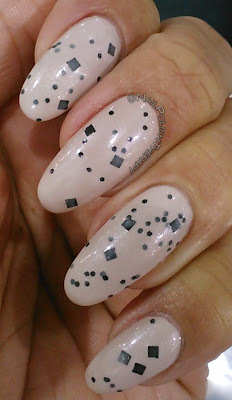 Such a simple black and white glitter in a milky pearly base I had to have it! I layered it over Loreal "Tea and Crumpets". I was not so impressed with either formula to be honest. 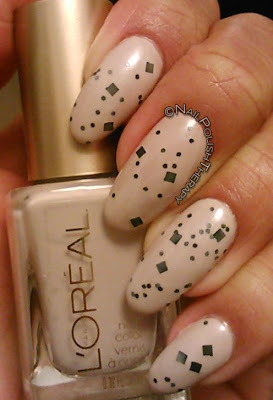 Loreal's Tea and Crumpets was streaky and Aphrodite's Lacquer was hard to apply evenly with the squares being so elusive. I left the bottle upside down and shook it before each application but I could barely get the squares out. Even with all the trouble I still like out how it turned out. I think next time I will use the Aphrodite Lacquer on it's own. Maybe with a little bit of thinner and a balister ball it will mix better.